*first published online at http://www.efy.com.my on September 10 2015. Despite his lofty position as Ricoh Malaysia’s managing director, Peter Wee comes across as a humble and approachable man. His passion is infectious when he speaks about the printing industry and how he runs the business. The company’s commitment to green initiatives are one of their core values – proudly displayed on their website in a series of badges. These include Green Office Certification, Gold Medal for International Achievement in Sustainable Development and numerous awards from the US Environmental Protection Agency.Their corporate profile proudly lists Ricoh as one of the Global 100 Most Sustainable Corporations in the World, as well as one of the World’s Most Ethical Companies by the Ethisphere Institute for the past three years. But these achievements were not easy to achieve or maintain, as Wee pointed out. “When we design our machines, we always look at our carbon footprints. If it doesn’t meet the minimum requirements, we go back to the drawing board and redo it.Being eco-friendly is not only through our manufacturing. It’s a holistic system, from production to procurement and transportation to the things we use,” said Wee. Protecting the environment goes beyond mere corporate responsibility – it’s also a point of differentiation.“For example, our gel jet printers use eco-friendly gel jet made from vegetable compounds,” explained Wee. “We can’t sustain all our badges through a single effort alone, which is why we adopt a holistic system, from our production to procurement to transportation and the things we use. That is the soul of Ricoh, and I’m happy to say we have been in the forefront for the past 15 to 20 years,” said Wee. Wee is no stranger to leading businesses; having been with PricewaterCoopers (PwC) for over 19 years. He was appointed Ricoh Malaysia’s chief operating officer in 2012, overseeing everything from sales and finance to administration, and bringing double-digit market growth for the company within a short span of three years. Taking on the mantle of Ricoh Malaysia’s managing director earlier this year was no easy task, he shared. “It’s challenging. As MD, I’m responsible for the well-being of the 533 people under me. Each person has a family and mouths to feed, which essentially makes me responsible for 2,000 people,” he said. “It’s important for me to look at how to find new values in the market, so that my people can grow,” he added. On what helps Ricoh stay fresh and competitive in the market today, Wee shares a few nuggets of wisdom. 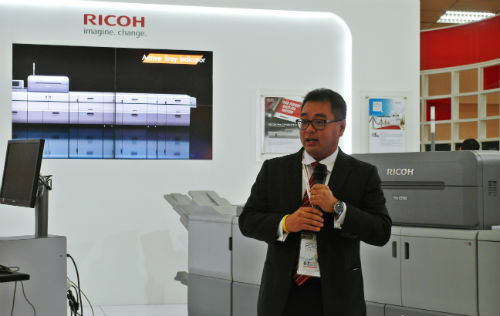 An example, he cited, was Ricoh’s recently launched C7100X series, which offers a fifth colour station – clear gloss and white toner – for a smoother, more beautiful printing finish. “When people buy a machine, it is an investment. With added value, it allows them to expand their horizons. The slant should not be simply about product selling,” said Wee. “You must bring new values and innovation, all the time,” said Wee, who staunchly believes in the company’s tagline, ‘Imagine. Change.’ “We have to change as a person, a company and a nation. We have to compete in the arena with everybody else, but also amongst ourselves,” he said. Like the general who leads the charge, Wee believes in being a good example to his staff.“As a leader, I have to make sure that I am at the forefront so that everybody moves forward to becoming a better organisation,” he said. “If you look at it, all of Ricoh’s hardware are network-connected. So how do I build value for my customers? I manage the network for them. That’s why I’m venturing into providing IT services, as well as surveillance and communications – it’s the highway that connects all the hardware,” Wee explained. But despite all these grand plans, Wee said that the driving force behind it was simple: to see the company grow. “I’m just a custodian, but whilst I’m here, it’s my responsibility to see that my customers and my people are happy,” he said with a smile.